We have been one of the sixteen teams selected from all around the world to participate in the Amazon Robotics Challenge 2017 (ARC2017 https://www.amazonrobotics.com/#/pickingchallenge) which will take place in Nagoya, Japan, in conjunction with the RoboCup 2017 (http://www.robocup2017.org/eng/index.html). The ARC is a competition sponsored by the company Amazon to find a robot that can autonomously move object in its fulfillment centers. No industrial robot can recognize even a tiny fraction of the millions of items Amazon sells, let alone pick, grasp, and move them safely. Nevertheless, Amazon is able to quickly package and ship millions of items to customers from a network of fulfillment centers all over the globe. This wouldn't be possible without leveraging cutting-edge advances in technology. Amazon's automated warehouses are successful at removing much of the walking and searching for items within a warehouse (some estimations talk about an average of 13 miles walk a day http://www.dailymail.co.uk/news/article-2512959/Walk-11-miles-shift-pick-order-33-seconds--Amazon-works-staff-bone.html). However, commercially viable automated picking in unstructured environments still remains a difficult challenge. It is their stated goal to strengthen the ties between the industrial and academic robotic communities and promote shared and open solutions to some of the big problems in unstructured automation. The first two challenges, formerly called the Amazon Picking Challenge, were held at ICRA 2015 and RoboCup 2016. This is the third edition of the challenge, and the complexity of the tasks has increased from a robot able to pick a selection of goods from shelves and pack them safely for shipping, to another able to recognize and manipulate new and unknown objects from Amazon boxes to shelves and vice versa. The challenge combines object recognition, pose recognition, grasp planning, compliant manipulation, motion planning, task planning, task execution, and error detection and recovery. An added difficulty is that not all the objects will be known in advance, testing the adaptability capacities of the robots. A project of this nature ans scope needs a huge knowledge base. The 18 members team has computer science engineers, industrial designers and physics, among others. 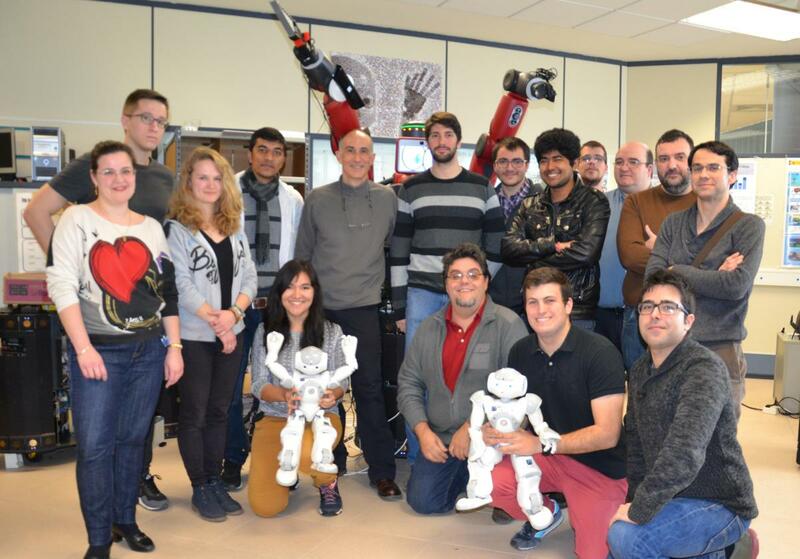 RobInLab has previous experience in this type of tasks, as it was the only Spanish team that participated in the first edition of the challenge and having developed systems such as the UJI Librarian Robot. In fact, the Spanish Science Ministry has conceded a research project, Robotic System for Picking Objects in Online Shopping Warehouses (RoboPicker) which covers this problem. The developed prototype will be adapted from a Baxter Rethink Robotics robot, and will be subjected to a thorough evaluation, validation and demonstration process in a relevant environment that faithfully reproduces the conditions of the challenge. We will also continue with some more theoretical research lines seeking to suggest ideas and proofs of concept that can help improve the different approaches to the problems posed by the challenge. As we can see in the photos we have already began the work to create the system. And we have appeared in several newspapers, as we are the only Spanish team that participates.